This was the word that I would repeat most often as I transitioned students from their classroom to the speech room for small group therapy. Depending on where the students’ classrooms were in the building, this transition could easily be a five-minute process. Kids, and anyone really, do not want to spend that time in silence. So they talk, twirl in circles, walk backward, and do a myriad of other taboo hallway activities. I needed to find a way to make use of our hallway time as therapy time and keep kids engaged. But how? When I thought about what makes a lecture great, or a speech phenomenal, one element always seems to be present… stories. Stories keep people listening. They keep kids from wandering off in the halls. They become natural ways to ask and answer questions. They present topics for conversation. Stories not only keep students close to you in terms of proximity but also in terms of focus. What better way to help kids transition to their specialized services than to engage them in a story? Using a quiet voice, tell about an experience including what you did, where you were, how you felt and how it was resolved. Ask students questions about the story and then ask them to retell the events. Tell others about a dream that you had. Make sure to point out the odd or absurd things that occurred. Ask students to relate by telling about a dream of their own. Create a story based on what you think might happen in the future. Ask students questions about the story and then ask them what would need to happen for this to become reality. Take time to go over what you did together in your last small group session. Include all of the events, as well as details. Ask students how they felt about different areas and what they learned. Teach your students about history by explaining something that has actually happened. Tell them about a significant historical event and why it is important to learn. Ask questions and then have students retell the story. Fiction stories can be made up as you go or can be learned from books, myths, or fables. Choose a quick story with a beginning, middle, and end. Then have students retell the events and answer questions. I have even created a Story of the Week because I desperately wanted my students to transition quietly in the hall. I knew that although on some days I had the mental energy to create a story, on very few days could I recall what I had just said for more than a few minutes. As we travel in the hall, I read the story to the students. The students hold the photographs that accompany the story as they walk as a transition item. Upon entering the speech room, our first activity is to practice sequencing, retelling, vocabulary, and grammar. No matter what you choose to do, make the most of your transition times. Don’t lose those five to ten minutes to non-speech activities. There are so many ways to take advantage of this time! 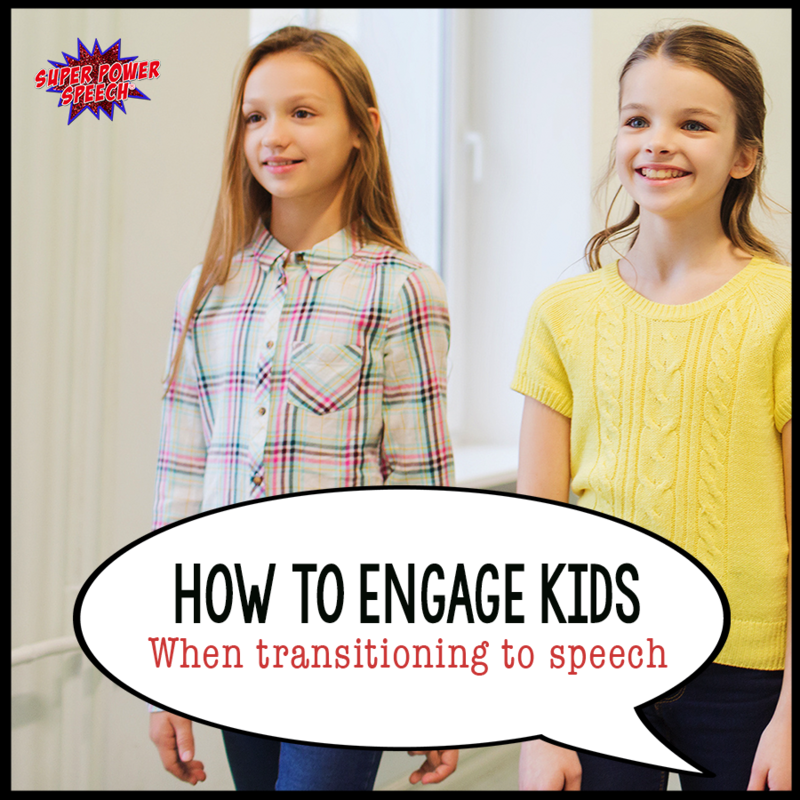 How to instruct kids while also transitioning them to another room. How to begin each speech session with a meaningful activity. How to begin each session with data collection. 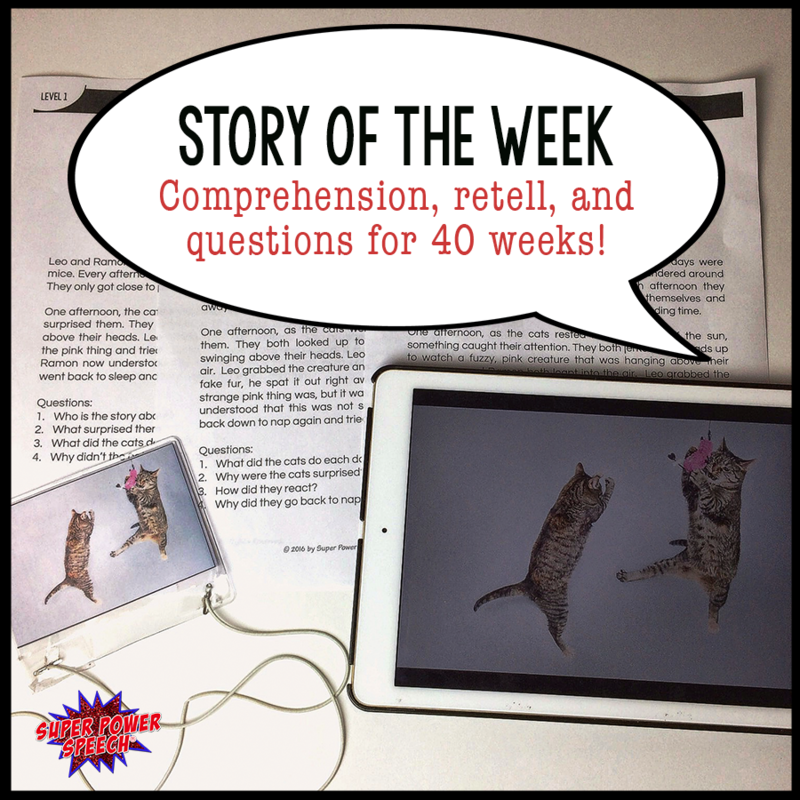 How to differentiate one story for different levels of language skills (Story of the Week has three language levels for each story). How to keep kids engaged by having new stories frequently. How is this intervention working? A lot of my students are transitioning when at least one other class is headed somewhere creating lots of distractions, but I like your idea! How many stories are included in that 205 mega sized file 🙂 ? Would you consider doing a couple of samples for others to try? I use the hall time as well. I give articulation students a word or phrase they must say with every step. Lots of reps! So many steps I have to change it up every few paces. Syntax or morphology kids get to make sentences about classroom artwork on the walls. Students working on basic concepts answer questions about the artwork as well. Kids working on narratives tell me what they did the previous night, or even just what they were working on in class when I picked them up. If I don’t use the hall time, I can’t meet IEP minutes. It is actually going really well. Thankfully I don’t have a ton of other classes transitioning when I am working on the stories! I love your idea of saying a word or phrase for every step! Brilliant! I like to do “Would you rather” or “What would you do” prompts. My students look forward to it, and we are using the 5 minute transition to work on language skills. Often I give the prompt, and then give think time. Sometimes, I give the prompt and then converse with a student working on social skills. The others then have the think time they need to explain their choice. Many times I have students ready to give me a prompt when I pick them up from class. I love that, because I can give an unrelated answer; the students have to catch me and tell me why my answer is not related. They need to see us make mistakes, too.